As the Siesta Key Association (SKA) continues to wage a battle in the 12th Judicial Circuit Court to try to prevent the dredging of Big Sarasota Pass, the value of preserving the pass in its virgin state was underscored on March 2 by the guest speaker at the nonprofit’s annual meeting. Dr. Philip M. Farrell, emeritus dean and professor of pediatrics and population health sciences at the University of Wisconsin-Madison, talked of discussions about Big Pass that he had with Richard A. Davis, emeritus distinguished research professor at the University of South Florida (USF). Those talks served as the basis for information in the book Farrell co-authored last year with his grandson, Thomas Philip Farrell, An Illustrated History of Siesta Key. Furthermore, “swash bars,” which are visible from higher points on the island — including buildings at Siesta Public Beach — bring sand to the island, Farrell pointed out to the SKA audience. If sand is removed from the pass, Farrell added, “There’s no doubt whatsoever” that damage to Siesta will ensue. Farrell’s remarks followed outgoing President Gene Kusekoski’s review of the SKA’s top initiatives in 2018, including the Circuit Court case. (See the related article in this issue.) 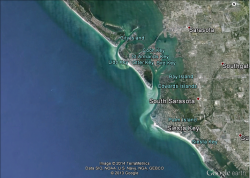 The nonprofit has asked the City of Sarasota for more than two years to comply with the city’s own comprehensive plan in ensuring that no harm would come to Siesta Key as a result of the city’s plans to dredge up to 1.3 million cubic yards of sand from Big Pass to renourish an approximately 1.6-mile stretch of South Lido Key Beach. Her order was based on a second amended complaint, in which the SKA sought a Writ for Mandamus. The SKA asked her to order the city to seek permission, the SKA says the city needs from Sarasota County leaders before the city can undertake any initiative in Big Pass. That petition also pointed out what the SKA has contended are the city’s obligations according to its own environmental policies. “Finally, we found a judge who read the latest argument” and agreed that it made sense, Kusekoski told the audience at the March 2 Annual Breakfast Meeting. “Hopefully, we’re going to make some progress,” he continued, with the city finally being forced to request permission from the county to dredge Big Pass. “Worst case,” he continued, “the county says, ‘Fine.’” The best case, Kusekoski added, is that the county tells the city it can proceed with the plan only after an in-depth analysis of the potential impacts of the sand removal has been completed and shows no harm would result to the Key. On March 1, the counsel for the city in the case asked the court for a 14-day extension of the deadline for the city’s answer, through March 18. McHugh’s Feb. 11 order had given the city 20 days. John R. Herin Jr. of the Fox Rothschild firm in Miami attributed his request “to other pressing workload commitments,” as well as the fact that he recently began working for a different law firm. Kent Safriet of the Tallahassee firm Hopping Green & Sams, the attorney for the SKA, notified the court that the SKA opposed the extension through March 18. In a March 5 ruling, Judge McHugh ended up giving Herin through March 14 to respond to her Feb. 11 order. In that response, which was filed on March 14, Herin referenced “an undocumented and unverified meeting that purportedly took place on May 23, 2017,” between SKA representatives and senior city staff. In its second amended complaint, the SKA argued that during that session, SKA members formally asked city staff to submit the proposal for the dredging of Big Pass to county leaders. City Manager Tom Barwin and City Engineer Alexandrea DavisShaw both attended that May 2017 meeting, new SKA President Catherine Luckner has asserted. Such a demand is necessary, McHugh told Safriet during a December 2018 hearing in the case. Herin also stressed in his response that the SKA and its co-plaintiff in the case — Siesta resident David Patton — have failed “to allege in any of their complaints that they made an express and distinct demand” upon the city to make a determination that the dredging is consistent with the city’s own comprehensive plan. Siesta Sand learned at the time of press – On March 20, Judge Andrea McHugh wrote, given the fact that the city disputes the SKA argument that the nonprofit “ever made a legally adequate demand upon the City for a determination that the Project is consistent with the City’s Comprehensive Plan, the Court finds it appropriate for [the SKA] to file a reply.” Citing City of Sarasota arguments, Circuit Court judge gives Siesta Key Association 20 days to convince her why she should not dismiss nonprofit’s latest petition.